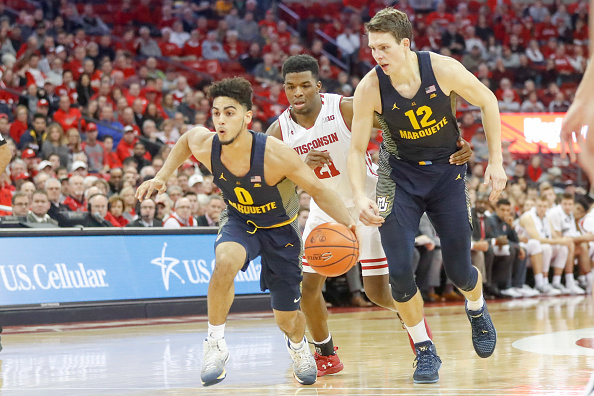 Another chapter in the Wisconsin/Marquette rivalry will be written on Saturday as the they collide for the 125th time and at Fiserv Forum for the first time. Here are five storylines to watch for. Markus Howard picked right off from last season in terms of scoring with a Big East-high 22.8 points per game and dropped 45 points in an 83-71 win over then-No. 12 Kansas State on Dec. 1. Wisconsin fans know what kind of damage the junior can do as he delivered 23 points in Marquette’s 82-63 win in Madison last season. Wisconsin senior Ethan Happ has experienced the highs and lows of the rivalry and looks to go out on the right note. Happ’s production has been top notch with the most double-doubles in Division I at seven out of nine games. Points are not the only specialty as Happ is second in the Big Ten in rebounds with 10.8 per game and third in assists with five per game. Happ would like to get a bad taste out of his mouth after picking up two fouls within the first 101 seconds of last season’s game, which resulted in sitting out for the remainder of the half and allowed Marquette to control the tempo. Within the team game are the individual connections as MU’s Theo John and Wisconsin’s Brad Davison have gone up against one another going back to the days of grade school. While Wisconsin’s Trevor Anderson’s season came to an end with a knee injury on Dec. 6, the thread between the redshirt sophomore and the Hauser brothers (Sam and Joey) go back to prep school at Stevens Point Area Senior High. Nebraska transfer and Marquette junior Ed Morrow has prior experience against Wisconsin from 2015-17 and posted 13 rebounds two seasons ago. Expect Morrow to provide key minutes off the bench in Saturday’s game. A glaring weakness from last season was Marquette’s inability to penetrate to the rim and draw fouls, which left the free throw stats one-sided. The KSU win provided a sign of change as Howard drew 13 fouls and went 19-of-21 from the charity stripe. The extra opportunities have reflected on the stat line as Marquette is first in the Big East in free-throw percentage at 75.9 percent. The Badgers’ DNA has always been precise shooters from anywhere on the floor and D’Mitrik Trice has carried on the legacy. Trice leads the country in three-point percentage at 60 percent after missing the final 23 games of last season with a foot injury. Trice’s sharpshooting could be a key as to how far the Badgers can go against the Golden Eagles.